Here’s the second installment in my How to Organize series! What’s it all about? Click here to get the scoop and then come back for the scoop on how to deal with those pesky junk draws. I’m sure that everyone has a “junk drawer.” You know, it’s the spot where you throw stuff because it doesn’t belong anywhere else. I am very neat and organized. Very. However, even I have a junk drawer. Remember neat freak Monica from Friends and her secret closet? That’s how I feel about my junk drawer. I clean the junk drawer often but, mysteriously, it gets messy again very quickly. In fact, my husband doubts that I ever clean it because even on its cleanest day it’s still a disorganized mess. Meh. Basically, my junk drawer annoys the crap out of him. In fairness, he really doesn’t put any of his stuff in there, so I have to grant him this one. On my recent quest to organize the heck out of our home, I knew that that the junk drawer had to be improved. Sure, I’ll still have a bunch of junk in it that I want easy access to. But it’s got to be organized. The solution is a drawer organizer. 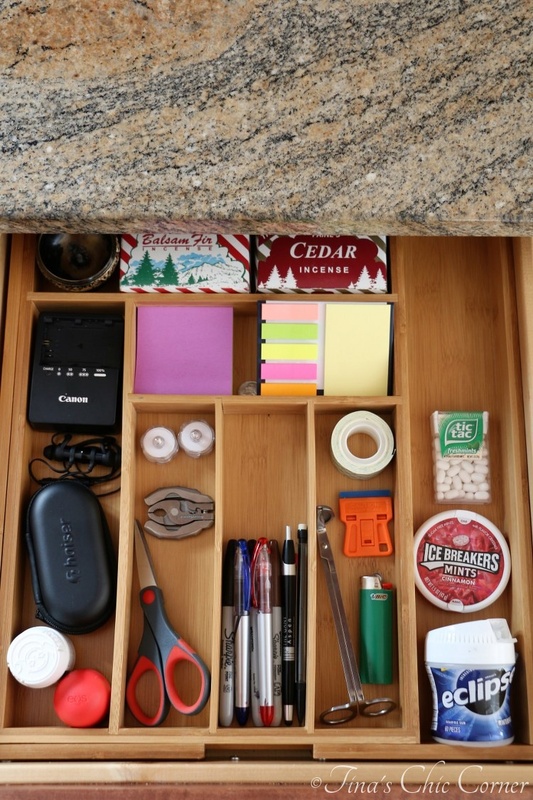 We bought this expandable drawer organizer (shown in the picture below) and it’s uh-mazing. The secret with a drawer organizer is that there is no room to shove paperwork (my worst offense). Plus, the organizer has a limited number of spots to pile stuff in. Meaning, if I want to add something to the drawer then I have to get rid of something else to make space for it. What you choose to put inside your junk drawer is up to you. The stuff I have in it is specific to my needs, and quite frankly is not exciting in the least. (Which is why my husband calls it a “utility drawer” that just happens to have been taken over by junk.) Your goal is to find a drawer organizer that fits inside your drawer and any one will do. I recommend a tape measure to keep you from getting it wrong, but keep in mind that it may still take a little math because almost no one lists dimensions in the same order. To help make it even better, we chose an organizer that is expandable. That means it has little pull out extra space things that make it use up more of the drawer. You can find all sorts of organizers in various materials and prices. We are happy with the one that we got. We bought the drawer organizer about three months ago and it still looks exactly the way it did when we first organized it. I’d say that’s a success!